Does your child’s behavior make you feel out of control? Do you find yourself walking on eggshells so that you don’t “set him off?” It might be your five year old who has tantrums and acts out, or perhaps it’s your teenager who fights with you all the time. Your consequences mean nothing to him, and in fact seem to make him more defiant. Whatever the reason, you’ve got the kid who simply doesn’t react to parenting the way you thought he would. Debbie Pincus, creator of the Calm Parent: AM & PM, explains how you can change the way your family interacts. When a child becomes the “anxiety sponge” for the family he or she will often develop some problems. While there are many helpful techniques parents can use with their kids—in fact, Empowering Parents is full of articles that will help you parent more effectively—I’d like to view this problem from a slightly different angle today. So let’s step back and look at the big picture: What really happens when a kid acts out chronically in a family and the attention all goes to them? And how can parents turn this around? In order to turn things around with your child, I believe it’s helpful to widen the lenses that we use to view our difficult kids. Let’s say you’re focused on your acting-out child—attempting to fix and change him—only to find that his behavior is worsening. (Or perhaps it changes, but only temporarily.) To a certain extent this happens because you’re looking at your child as the “problem” rather than seeing the way the family operates as a whole. When you can see your family in this new way you’ll recognize that your child is only part of this unit—a fragment of the whole. What do I mean by this? Think of it this way: Each family member is only a part of the larger group. 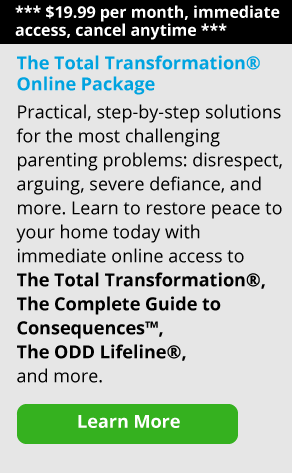 Children with problem behaviors are rarely the underlying problem, though some kids are more defiant and rebellious from the start, and therefore more difficult to parent. They may come this way, genetically predisposed to act out more and be rebellious. As a result of their difficult behavior, you naturally begin to focus on them. For the most part, kids who act out are symptoms of something much larger—often, it’s an emotional or relationship problem. This does not lay the blame on anyone; it simply means every member of the family group is a contributor in some way. I believe that if you want to go about changing the problem, you need to get the focus off the “symptomatic” one and instead onto the relationship patterns in the family. I also want to add here that if this is going on in your family, it’s not too late: it’s possible to change your family’s pattern no matter what stage you’re in with your child. Let’s consider how anxiety travels in a group of people. If Dad comes home from work upset about a deal that didn’t go through, he may automatically take it out on Mom by criticizing her about the messy house. Mom may react to this by shutting down or defending herself, but either way the anxiety has moved to Mom. Next Jack, the two-year-old, seeing or feeling Mom’s distress, starts crying. The anxiety has moved to him. Now Chloe, the six-year-old, experiences this emotional intensity and feels uncomfortable and upset. She runs to her room and starts yelling and acting out. In this way, anxiety moves from person to person in a family unit. This is a natural and automatic response. Most of the time, rather than disturbing everybody in the family, anxiety seems to settle in one person—often a child. In the family just described, the original anxiety exchange was between the two parents. If they don’t get it worked out over time, the six year old might continue to react to the intensity by acting out more and more—and the adults will begin to focus on her. Not realizing that their child’s response is an expression of anxiety that came from the family unit, they may come to see her as the problem and begin worrying about her. The more she is fretted over, the more anxious and symptomatic she will become—and the more symptomatic she becomes, the more focused they will become on her. The cycle has now been set in motion. When a child becomes the “anxiety sponge” for the family he or she will often develop some problems. If the adults put the focus on the child and not on themselves, they never get to resolve their own problems or ineffective patterns—instead, the over-focused child will develop problems. Take into account that when anxiety collects in a person, their brain and body chemistry becomes changed. As a result, the child may show hyperactivity, learning issues, or behavioral or social symptoms. Once a disorder develops, more and more intense focus is drawn to their problems at home and at school. It becomes a vicious cycle that’s hard to stop. This snowball effect can start simply: Let’s say every time a mother is upset, she offloads her stress by complaining loudly. The father shuts down and withdraws and then the child picks up on his distress. Kids are very tuned in. If you have a child who’s particularly vulnerable to moods, he might absorb or take on the stress and become the sponge. You’ll see him becoming anxious in some way; he’ll be the one with the “symptoms.” While there’s no one to blame for this, it’s ultimately our responsibility as parents to keep an eye out and not let our stuff spill onto our kids. 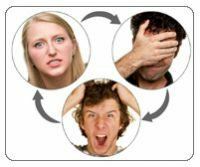 If you see this cycle happening in your family, the first thing to do is recognize it for what it is. Stop it by taking the intense focus off your acting-out child and pay more attention to yourself and your relationship patterns. Ask yourself some hard questions, like the following: “By putting so much focus on my child, what do I get to avoid in myself and in my own adult relationships?” Consider what he might be expressing through his behavior. Are these expressions of tension in the family, or ineffective relationship patterns that need more attention paid to them? Remember that your family, not your child, is the emotional unit. This will help you see that you are a part of the problem, and also part of the solution. Work to change what is under your control instead of worrying, over-focusing and trying to control your child. If you begin to see that your child is the symptom-bearer of the family unit rather than a “problem child,” you’ll be more understanding and empathetic rather than angry and frustrated. Don’t get me wrong, you still need to hold him accountable for his poor behavior. But now, instead of seeing him as “broken” or the problem, you’ll hold him to higher expectations. Don’t get me wrong, when our kids are acting out, we need to hold them accountable rather than anxiously focus and fret about them. What’s the difference between anxious parenting versus being parental? Being responsible and standing our ground is being parental, because we’re doing what our child needs to guide him to a better place. Anxious parenting happens when our emotionality slips in and we start reacting to our child rather than responding to his behavior thoughtfully, and most of the time we don’t even realize we’re doing it. Pause and ask yourself some important questions. Why aren’t I taking a firmer stand right now when I know that would be best? Am I acting from my best principles that might cause some short-term pain for some longer-term gain? Am I afraid to discuss some issues with my spouse? To avoid each other do we instead deflect onto our kids? Are they getting caught in the middle and acting out this adult tension? Most of the time we think we’re being thoughtful in our responses to our acting-out kids but often we’re actually being reactive, adding fuel to the already hot inferno. Take care of yourself. Take care of yourself emotionally and physically, so your children don’t end up with that job. Pay attention to and attend to your adult relationships. Instead of being irritable and upset, say what’s on your mind. Resolve issues so that your unresolved anxieties don’t get spilled on to your kids. Observe. Observe yourself and your relationship patterns: your own thinking, feelings and behavior. See how your family’s (both nuclear and extended) emotional pressures contribute in producing your child’s negative behavior. Consider what’s going on from wider lenses. See the whole family drama. Set limits and give enforceable consequences. If your child is acting out, set limits and give him enforceable consequences. Take charge, not control. Be parental; don’t parent with an “anxious focus” on your child. Recognize your own contribution. Start with yourself and go from there. After all, you’re the only one you really have control over in life. Look at what’s in your hands, not what’s not in your child’s hands. Watch what you’re doing and try to be as clear and direct as possible. You’re not responsible for your child’s outcome and you’re not the cause of the problems. If you can look at your contribution then you can change that part of yourself that’s adding to the cycle of anxiety and bad behavior. Try to parent from your principles, rather than from your deepest anxieties. By understanding how your family operates—and how anxiety operates in your family—you can use your principles to guide your thinking and responses. This will help to stop the reactivity that often gets moved from one family member to the next. Your principles, rather than your anxieties, will lead the way. And when you see your child as separate from you, you will also see yourself more clearly and more objectively.